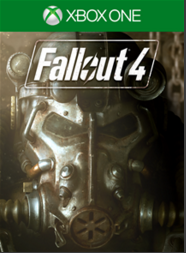 The long awaited Fallout 4 (Bethesda’s third Fallout title, coming five years after New Vegas) released last week to the excitement of millions of gamers around the world. The release was so significant, that Pornhub reported a ten percent drop in traffic the day of the game’s release, as reported by VentureBeat. In fact, Fallout 4 shipped over 12 million copies on the day of its release, raking in $750 million in a single day. In contrast, Bethesda’s first Fallout game, Fallout 3, sold just 4.7 million copies in its first year and Skyrim shipped seven million units in its first week. Fallout 4 has already proven to be an extraordinary success. My first Bethesda experience was with The Elder Scrolls III: Morrowind on the Xbox in 2001. On Christmas morning I set up my new Xbox and stuck in the disc that would soon spend hundreds of hours inside my Xbox’s disc drive. I was immediately blown away by the amount of freedom to explore and do anything I wanted. If I wanted I could take out a sword, slaughter a store owner and steal all of their supplies. I could try to convince another character to help me, or I could strike them down and be done with them. I could travel anywhere in the world at any time, with hardly any restriction. It was truly mind blowing to experience such an open game. My first experience with Fallout 3 was just as incredible. The detailed opening sequence inside the vault was unlike anything I had previously experienced. The freedom to complete objectives via multiple means (violence, persuasion, etc.) and the multiple outcomes of various quests was revolutionary. I was instantly in love and utterly addicted. Fallout 4 has so far lived up to much of the hype. The pre bomb drop opening sequence was interesting (though rather uneventful) but the real fun begins once you’re let loose into the wasteland. Emerging from the vault for the first time and setting sight on the vast wasteland is both daunting and exhilarating. There’s so much to explore and experience, it’s hard to decide where to start. Part of me wanted to just head as far as I could in a random direction just to see what I came across, yet I found myself following a somewhat linear path into the wasteland. By linear, I mean I feel like the path I ventured down so far has been crafted by Bethesda if that makes sense. Most of what I’ve experienced so far has been the same as others I’ve talked to. What seem like random encounters (a mole rat with a bomb strapped to its back) turn out to be quite scripted, at least in the sense that everyone else seems to have experienced the same encounter at around the same play time. This isn’t a bad thing, I just think it’s a consequence of how most people play games. We’re afraid to miss anything, so rather than venture to the very end of the map, we explore away from the vault in a careful, calculated manner. Despite feeling like I’ve been led along a crafted path, I’ve enjoyed Fallout 4 immensely during my seven hours spent playing so far. The shooting is much improved over the previous Fallout games which makes the V.A.T.S. system much less necessary to succeed. V.A.T.S. is still useful, as it slows down time and can help you target a hard to hit enemy at a critical moment during a firefight, but it’s much easier and less frustrating to down enemies aiming on your own than it used to be. I’m not necessarily a fan of the new critical hit system, in which you have to trigger a critical hit once the meter is full. It was always a pleasant surprise to score a critical hit at random; triggering a critical hit with a button press is much less satisfying. Another significant change in Fallout 4 is the abandonment of the text boxes of Fallout 3 and New Vegas in favor of fully voiced dialogue. In theory this is a good move, but so far I’ve found a lot of the voice acting to be flat, spoken with the enthusiasm of Peter Dinklage’s Ghost from Destiny. The main character and Preston Garvey’s lines are particularly dull and dreadful so far. I’d almost prefer text, as I’ve found the dialogue to detract from the otherwise wonderful experience. I can only hope it gets better as I explore more of the game. The inputs for responses also leaves much to be desired. It’s not always clear what your character will say before choosing a selection, and I miss the dialogue trees of the past which provided more detail. 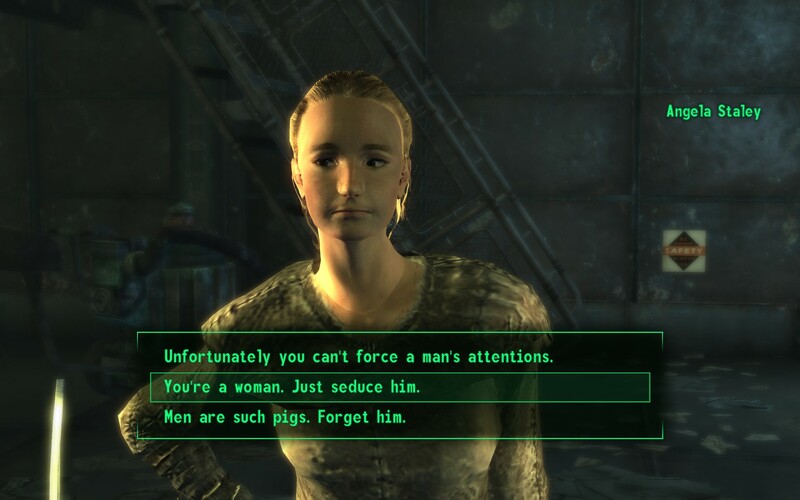 There was also much more charm and wit within the dialogue options that doesn’t seem to exist in Fallout 4. Several times there have been responses simply labeled as ‘sarcastic’. I’d rather see all of the options, rather than blindly picking a response based on vague descriptions. Despite these minor complaints, I’ve been having a wonderful time exploring the world of Fallout 4. 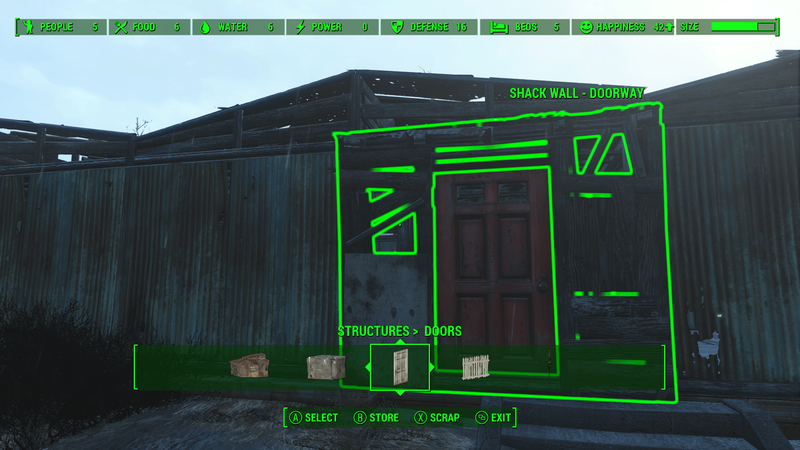 I didn’t expect to spend very much utilizing the settlement building features, yet they’ve proven relatively easy to use, although they can be a little rough around the edges (it can be difficult to get objects to conform to the ground, often resulting in partially floating objects). I haven’t yet experienced any benefits of building up settlements, but hopefully it’ll prove a worthwhile task in the long run. 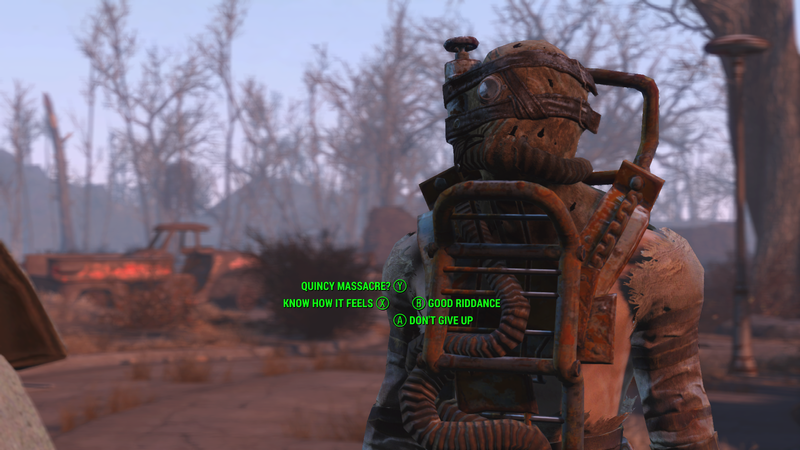 Fallout 4 may lack some of the wit via dialogue options that feature in the previous games, but it’s not entirely without its trademark humor. 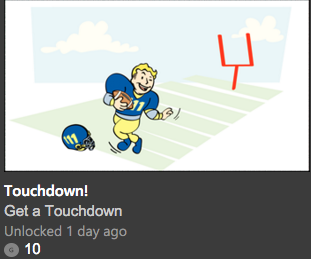 I started seeing the achievement ‘Touchdown’ pop up in my Xbox feed and was wondering exactly what it meant. And then I earned the achievement, entirely by mistake, and it brought a smile to my face. Clever one Bethesda! I have so much more to experience within Fallout 4, and I can’t wait to venture further into the wasteland. I hope to log a few more hours later today before another lengthy workweek begins. Who knows what I’ll run into next. This entry was posted in Video Games and tagged Fallout 4, Fallout 4 dialogue, fallout 4 voice acting, Fallout 4's dull voice acting. Bookmark the permalink.